Tragedies of Abortion in America Before Roe v Wade The landmark US Supreme Court decision in favor of legal abortion did not affect the number of babies delivered in the years following; there was, however, a drastic decline in maternal mortality. There has always been abortion on demand for those women who do not feel they can have a baby, either by do-it-yourself with drugs or by instrument self-inflicted or assisted. There always will be abortion on demand. 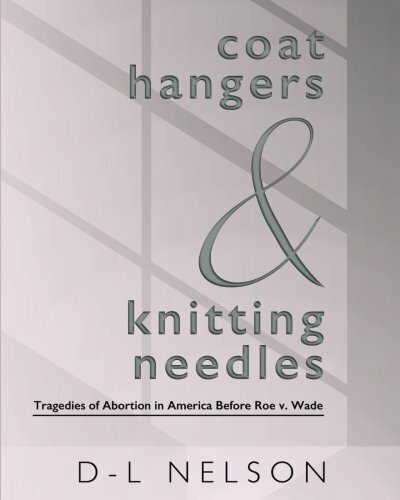 If abortion becomes illegal again, women will once again seek the backrooms, the motels, the shacks, the coat hangers and knitting needles. The only difference will be when abortion is illegal, will the mother die too Based on extensive research, including interviews with documentary filmmakers and activists, D-L Nelson describes the crusade against botched illegal abortions through the personal stories of the women who suffered, those who preyed upon or vilified them, and doctors and clergy who cared enough to get the laws changed. From Sarah Grosvenor, at the center of one of the first abortion trials in the New World ... to popular children's TV star Miss Sherri ... to Madame Restell ("the wickedest woman in New York") ... Anthony Comstock, Lawrence Lader, Bill Baird, Curtis Boyd, David Grimes, Henry Morgentaler ... the Clergy Consultation Service and the Jane Collective ... to Norma McCorvey, Linda Coffee and Sarah Weddington, you'll learn the backstories of men, women and organizations who were key players in the abortion and birth control debate across the 18th, 19th and 20th centuries. The book features a detailed timeline of abortion milestones from 3000 BC to the present, plus a bibliography of books, periodicals, films / videos and websites.